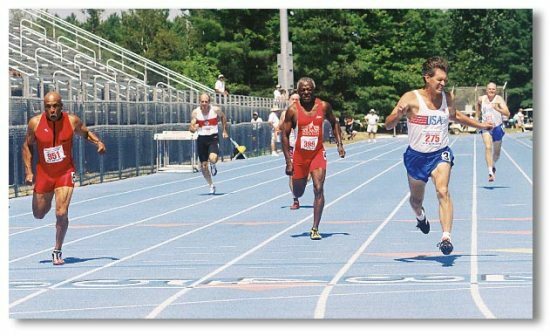 This is a guest post by Eric Dixon, a certified IAAF Level 5 Sprints/Hurdles/Relays coach. Click here for Part 1 yesterday. Warm-ups: The warm-ups are important to prevent injuries. They should take at least 20-30 minutes to raise the core temperature and get your muscles ready for sprinting. The warm-ups are done from low intensity to high intensity with each segment and rep. The intensity of the workout scheduled for the day will determine what dynamic warm-up drills I do. You’re also warming up the Central Nervous System (CNS). The CNS is a critical component that needs to be warmed up, and is usually forgotten about – not just in the warm-ups, but in the entire workout/practice (another article). For myself and the athletes I coach, I do not promote static stretching unless it’s absolutely necessary. In addition, not until after you’ve completed the whole warm-up routine. I’m not against static stretching I just don’t like it done when the muscles are cold. I believe static stretching places microscopic tears in the muscle fibers, which can cause serious problems later. I explain this concept to my athletes with the rubber band vs. muscle analogy by taking a rubber band out of the refrigerator and stretching it. What happens to the rubber band? Could it break or tear? Think about it (of course, I could go into more detail on this topic but that’s not for today). In addition, you’re stretching the muscles in ways that you’re not going to use them. Plus, while you’re doing your static stretching your cooling down because you’re not moving fast enough to keep the blood pumping to the muscles your about to sprint with. Also, you increase the chances of diminishing your power output with static stretching. Again, the rubber band analogy; if you pull and hold it too long it will eventually decrease in its power output and thus not travel as far when released. This is because you’ve stretched out the elasticity (Stretch Shorting Cycle or SSCs). If you do the dynamic warm-ups properly you shouldn’t need to do static stretching. I feel that static stretching does have its place. However, it should be performed only if necessary and after your “Warm-up routine” or after the workout but only in moderation. 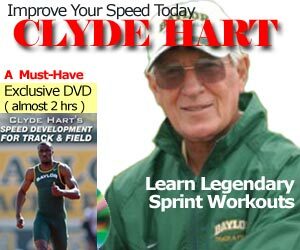 Coaching: You will need an experienced sprint coach. Your chances of success will greatly improve if the coach is a Masters competitor or has coached or is coaching Master Sprinters. I know it’s hard to find good sprint coaches but in the long run it’s better for your health if you do your homework. So take the time to look for someone who knows your event(s). Find out who they’ve worked with ask for a resume and references. Find out who you will be training with. Your coach should have a basic knowledge of the Multi-System Training Philosophy. This would consist of the: Musculoskeletal System, Energy System, Neuromuscular System, Neuroendocrine System, and the Proprioceptive System which, is all part of the physiological aspect of Sprint training. They should also have knowledge of Psychology (to motivate) and know how to communicate effectively. They must also utilize an effective Training Philosophy as oppose to winging it at practice. Not to mention the Technical aspect of sprinting like “Block Work” how to run the turns, breathing technique(s) and the mechanical aspect of sprinting i.e. form. Equipment: You will need proper running shoes for your type/style of running (foot strike). Take the time to do it right get a foot analysis to reduce the chance of injuries. Don’t play with your feet. If you’re running correctly you’re placing roughly 3 times our body weight per-square-inch (psi). However, if not then the weight ratio could be 4-5 times your body weight. That’s a lot of pounding on your skeletal structure. So please take good care of it. Nutrition: Nutrition plays an important role in your comeback. You need to maintain good bone health with a balance diet. In addition, it’s important to your glucose levels, weight control, cardiovascular and overall general health. You’re placing a lot of stress on your body therefore; pay special attention to your calcium, vitamin D, micro-nutrients, and protein levels. FYI: excessive caffeine (4+cups a day) and sodium (>1 teaspoon a day) can contribute to bone loss and increase the risk of hip fractures in both woman as well as men. Strength Training: Before you start core and weight training you should consult a physician to ensure there are no precondition problems. As we get older there’s clearly a drop in strength. There is a 5 to 10 percent drop in muscle strength per decade. This is due to the gradual loss of muscle tissue during the aging process. But there is hope. Fortunately, with regular weight training you can preserve and even increase muscle strength. Strength training will also help you maintain bone density. So weight training is a must for both man and woman. Also, make sure you perform the exercises correctly. Also, a Personal Trainer (PT) is not a Strength Conditioner Trainer and neither is a Sports Strength Conditioner (again another article). Sprint Training: Again before, you start sprint training you should consult a physician to ensure there are no precondition problems. In addition, I can’t stress it enough to start off slow and increase the speed training. Make sure you have proper sprinting form. Remember, you’re teaching your body form when you’re going slow as well as fast. Your elbows should be at a 90-degree angle (between upper and lower arm) on your sides and not coming across the body. If you’re running faster than 75% of your top speed (for most of you), you should be on the balls of your feet with toes up (dorsal flex). You’re sprinting and should get into the proper sprinter’s form and slightly leaning forward (pelvic tilt). If you’re running less than 70% of your top speed, then you are not on the balls of your feet; you’re jogging. If you cannot hold the proper form then you need strength and core training. Substance Abuse: Don’t do it! Sometimes the quest to return to the glory days is so compelling that some athletes young and old will cheat. There are numerous articles and reports on several Masters Competitors who’ve been caught with Hormones and Anabolic Steroids. It’s not worth your health. You may be wondering why I did not list workouts if, you’re training for general conditioning then your fine with general workouts. However, “Individualization” is the key if you’re training for competition. You’ll require a training program tailored specifically for you. In addition, Specificity; your training program should also be tailored to your event(s). You need to have an evaluation by your coach to determine your speed, strengths, weakness, etc… Only after should you receive a training program to determine your goals if you want to do it correctly. Remember, the mind is willing but the body needs to catch up!!! With the proper training you can get back to the glory days. Or if you just decided to take up sprinting later in life like Kathy did that’s great; Welcome to the Speed continuum! Just remember take it slow in the beginning and your comeback will be a healthy and prosperous journey. Note: Sprinters should not do long distance jogs for warm-ups. That’s old school and reason for another article. He is also the co-writer with several leading health and fitness experts the fitness book The Definitive Guide to Youth Athletic Strength, Conditioning and Performance .